Hydroponics has been around since the 1930’s when US Dept. of Agriculture scientists experimented, using water soluble fertilisers to grow plants. Then during the Second World War the US Army gave it a huge boost when they successfully used hydroponics to feed their troops in the South Pacific using the clear crystal water from the volcanic slopes together with beach sand. It did not start with the Hanging Gardens of Babylon, a misconception, as then they had no water soluble chemicals with which it could be done. Hydroponics uses water soluble nutrients to feed plants in a neutral growing medium such as composted pine bark, sawdust shavings, perlite or LECA pellets. There is no soil in hydroponics and the growing medium serves only to support the plants and conduct the nutrient to the root zone. Hydroponics has many advantages over traditional agriculture. For example, it supplies the plants with perfect nutrition, something that rarely happens in agriculture, owing to the soils’ random distribution of minerals dependant as these were on the volcanic action that formed them eons ago. Science has established that plants need 6 macro nutrients, seven micronutrients and three gases for sustenance, growth and reproduction. The pH of the nutrient water is critical to the absorption of minerals by the plants – too high or too low a pH results in a variety of absorption rates by the plants which can result in little or no absorption depending upon the mineral. A compromise level of 5.5 to 6.0 results in optimal mineral absorption by the plants. However, the Grand Prize in Hydroponics is the fact that it uses approximately one third of the water used in agriculture as the used nutrient water (leachate) can be captured and re-used, unlike traditional agriculture where water flows past the root zone and is wasted. Water is a scarce resource and South Africa is a water stressed country. Although it has a higher rainfall than Australia, South Africa has a bigger population competing for the water resources, resulting in its being classified as a water stressed country compared to Australia that is not. Combining hydroponics with vertical growing results in a double advantage as six times the number of plants can be grown in the same area by using the space above the ground. Less ground (also a finite resource) is therefore required to grow more plants. The high cost of vegetable foodstuffs, when purchased through a middleman, is also a factor to note. More and more housewives are saving money by growing their own and this can be done using hydroponic vertical growing in a shade cloth and gum pole greenhouse in the garden. This is the way of the future. 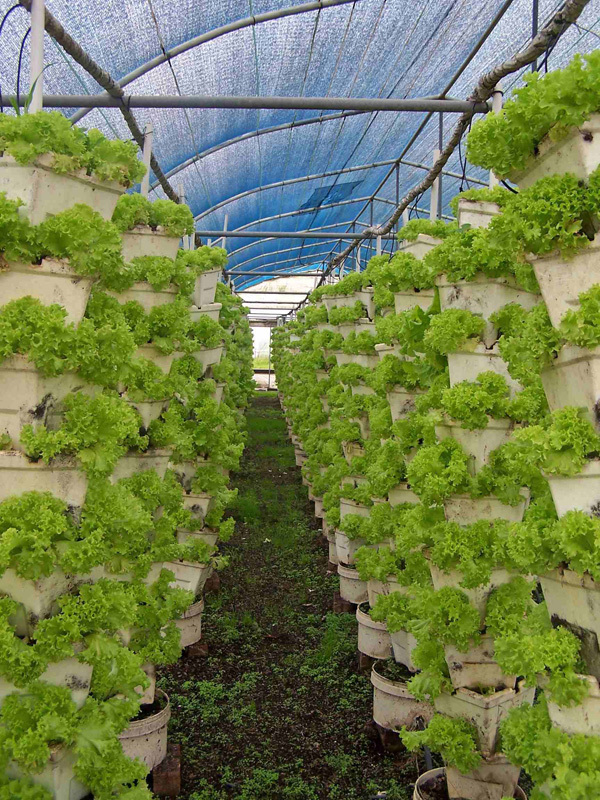 Picture shows lettuces being grown vertically in a hydroponic greenhouse covered with shadecloth.